The item Gift of Sanctuary represents a specific, individual, material embodiment of a distinct intellectual or artistic creation found in Evansville Vanderburgh Public Library. Under the pretense of escorting his father-in-law and the archbishop's secretary on a pilgrimage to the sacred city of St. David's in Wales, Owen Archer and Geoffrey Chaucer, in truth, are carrying out a mission for the Duke of Lancaster. England and France are at war, and the southern coast of Wales is vulnerable to invasion-Owen and Geoffrey are to recruit archers for the duke's army and inspect his Welsh fortifications on the coast, while quietly investigating whether the duke's steward at Cydweli Castle is involved in a French plot to incite rebellion in Wales. But trouble precedes them in the cathedral city of St. David's. 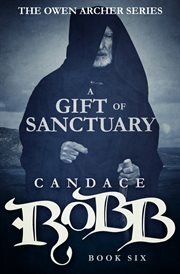 On Whitesands Beach beyond the city a young man is beaten and left for dead, then spirited away by a Welsh bard. Shortly afterward a corpse clothed in the livery of the Duke of Lancaster is left at the city gate, his shoes filled with white sand. Meanwhile, at Cydweli Castle, a chain of events begun by the theft of money from the castle's exchequer ends in a violent death and the disappearance of the steward's beautiful young wife. Owen and Geoffrey begin to see connections linking the troubles in city and castle, and learn they must unravel the complex story of betrayed love and political ambition to prevent more deaths. But in the course of his investigations in the land of his birth, Owen is haunted by doubts about his own loyalties..